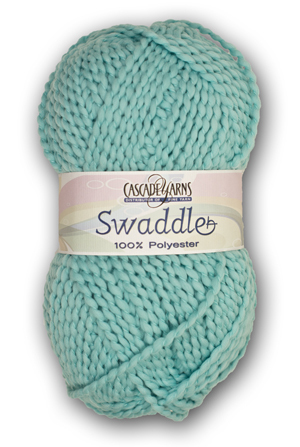 Swaddle is a cushy-soft 100% polyester yarn in a super-bulky weight. Swaddle offers a wavy construction, with a single-ply core wrapped with a smaller strand to give a slubby appearance. Swaddle comes in an assortment of pastel colors. This is a wonderful yarn for baby items, blankets and anything you'd like to be easy care.